(Bloomberg) -- Cultural risks are the greatest challenge to a successful merger of BB&T Corp. and SunTrust Banks Inc., according to Wells Fargo & Co. analyst Mike Mayo. 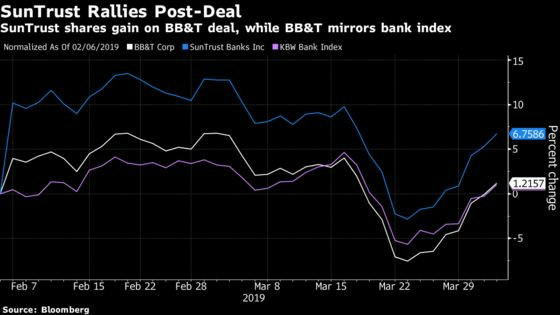 BB&T Corp. agreed in February to buy SunTrust Banks Inc. for $28 billion in the world’s largest bank merger in more than a decade. To analyze the risks associated with the combination, Mayo talked to Alisa Cohn, an executive coach and expert on corporate culture who isn’t directly working with the banks. Cohn has interviewed thousands of people, including board members, CEOs, middle managers and lower-level employees, over almost two decades and her clients have included Microsoft Corp., Pfizer Inc., International Business Machines Corp. and Google, Mayo said in his note. Tribalism: BB&T has a more hierarchical culture while SunTrust is more collaborative. “Conflict is natural when you have people working with different assumptions,” Cohn said in a Bloomberg Television interview Wednesday. CEOs: Other issues include whether SunTrust CEO Bill Rogers is comfortable waiting until September 2021 to become CEO of the combined company, and whether BB&T CEO Kelly King is willing to collaborate with Rogers. “In what may or may not be a telling sign,” Mayo wrote, King spoke three times longer than Rogers in a joint interview on CNBC. BB&T’s shares are little changed since Feb. 6, the day before the deal was announced, while SunTrust’s are up 5 percent. Both banks gained less than 0.4 percent at 3:31 p.m. in New York. While Cohn, the executive coach, hadn’t met with the management teams of either BB&T or SunTrust, she studied some of the interviews the banks’ executives did together and read reviews of each bank on Glassdoor, the online job-search network.